Family, friends and art lovers gathered in the New Brighton, Port Elizabeth home of the late pioneer artist George Pemba last Thursday for the unveiling of a portrait of Pemba erected by the Sunday Times as part of its centenary celebrations. The painting is the work of local artist Andrew Nhlangwini and depicts Pemba against a township background. "George Pemba is the first memorial to go up in the Eastern Cape," said Charlotte Bauer, the director of the Sunday Times Heritage Project. Speaking at the unveiling, Bobo Pemba said he was thrilled that his grandfather was being recognised by the Sunday Times. 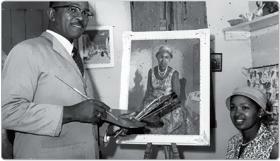 He also said a George Pemba art gallery will be opened in his grandfather's house in New Brighton next month.